Isaac Ambrose (1604–1664) was an English Puritan divine, the son of Richard Ambrose, vicar of Ormskirk, and was probably descended from the Ambroses of Lowick in Furness, a well-known Roman Catholic family. He entered Brasenose College, Oxford, in 1621, in his seventeenth year. Having graduated B.A. in 1624 and been ordained, he received in 1627 the little cure of Castleton in Derbyshire. By the influence of William Russell, earl of Bedford, he was appointed one of the king’s itinerant preachers in Lancashire, and after living for a time in Garstang, he was selected by the Lady Margaret Hoghton as vicar of Preston. He associated himself with Presbyterianism, and was on the celebrated committee for the ejection of “scandalous and ignorant ministers and schoolmasters” during the Commonwealth. 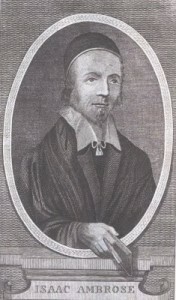 So long as Ambrose continued at Preston he was favoured with the warm friendship of the Hoghton family, their ancestral woods and the tower near Blackburn affording him sequestered places for those devout meditations and “experiences” that give such a charm to his diary, portions of which are quoted in his Prima, Media, and Ultima (1650, 1659). The immense auditory of his sermon (“Redeeming the Time”) at the funeral of Lady Hoghton was long a living tradition all over the county. On account of the feeling engendered by the civil war Ambrose left his great church of Preston in 1654, and became minister of Garstang, whence, however, in 1662 he was ejected with the two thousand ministers who refused to conform. His after years were passed among old friends and in quiet meditation at Preston. He died of apoplexy about 20 January 1664. Ephesians 6:12. Digital Puritan Press Paperback and e-Book available here. Hebrews 12:2, 1 John 2:2. Also appears in Works, below. Prima (the first things). Doctrine of regeneration, the beginning of a godly life. Media (the middle things). The means, duties, ordinances, both secret, private, and publick, for continuance and increase of a godly life once begun, till we come to heaven. Ultima (the end things). Meditations on life, death, judgment, hell, the sufferings of Christ, and heaven. Ephesians 5:16. Preached at the funeral of the Lady Margaret Houghton, January 4, 1657. A brief biographical sketch by the publisher – pdf, 4 pp. The Doctrine of Regeneration. (John 3:3) – pdf, 32 pp. Directions to a Man in the Act of the New Birth – pdf, 36 pp. The Practice of Sanctification – pdf, 12 pp. Of Self-Denial – pdf, 21 pp. Of the Life of Faith – pdf, 18 pp. Of Family Duties – pdf, 13 pp. Also appears as “The Well-Ordered Family” above. Looking unto Jesus. (Hebrews 12:2, 1 John 1:2) – pdf, 335 pp. The Ministration of, and Communion with Angels. (Hebrews 1:14) – pdf, 88 pp. Want to discuss something pertaining to Isaac Ambrose? Leave a public comment below (subject to moderation), or send a private message to the webmaster.